We at the Foundation would like to thank all that participated in the annual Trig Star competition this year. Our state competition was won by Anqi Duan. 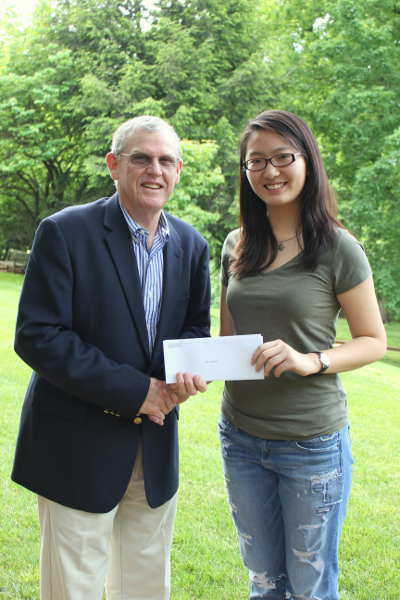 Here we have Sid Autry, the North Carolina Trig Star Coordinator presenting the $500 prize to our State Winner, Anqi Duan, a sophomore at Salem Academy in Winston-Salem, NC. The North Carolina Society of Surveyors Education Foundation was invited to participate in the Winston Salem State University Summer Technology Institute (SciTech). 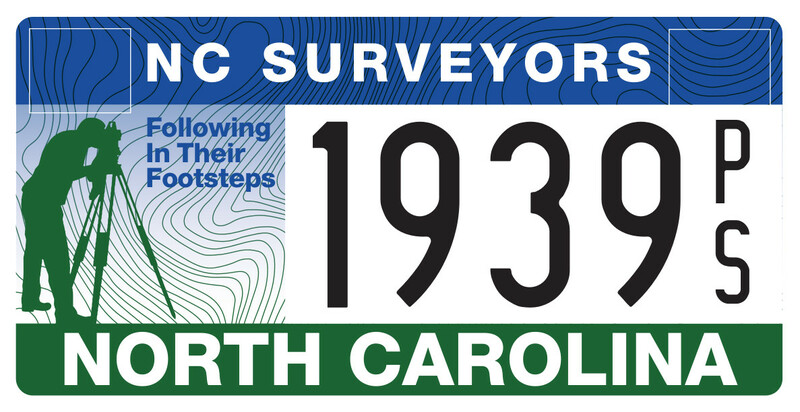 Anxious to introduce students to the surveying community an agenda was developed to provide a general overview of the many facets of surveying along with hands-on field applications. 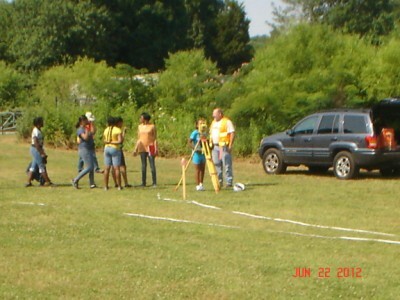 SciTech was held on WSSU campus with access to a state-of-the-arts classroom and an adjacent park area for field applications. The morning was kicked off by Doug Suttles, PLS presenting the NSPS video. After the video Doug gave a general overview of the Be-a-Surveyor and NCSS websites. 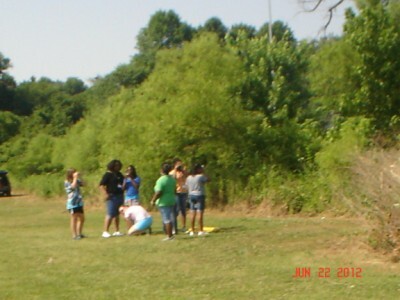 The group moved to the park where six stations had been setup to allow the students to interact with a Professional Survey and practice some basic skills. Lewis Moore, PLS manned the first station discussing measuring angles and distances utilizing a total station. 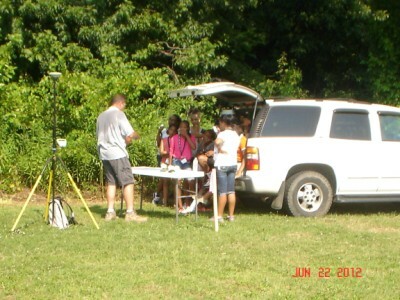 Clint Osborne, PLS was collecting GPS data along with demonstrating handheld GPS devices at station two. Clint taught a brief session on latitude and longitude and had the students record a GPS Lat and Long then find themselves on a flood map. Station three dropped back in time for surveyors; but what would we do without a good compass and the knowledge to use it. 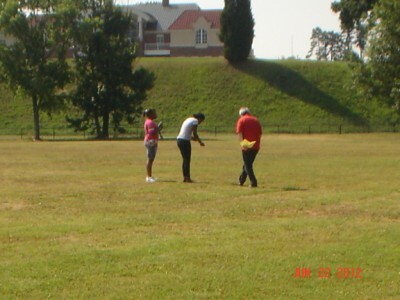 Doug Suttles, PLS used handheld compasses to teach the students direction and had them locate preset points using a compass, tape and metal detector. They all left station three knowing which direction north was. 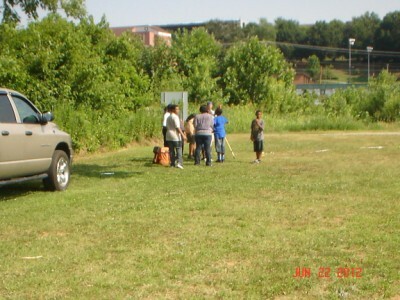 Gale Brown, PLS and Roger Johnson taught the fundamentals of stakeout at station four. The students had an opportunity to turn angles and tape to establish triangles and measure the missing sides. 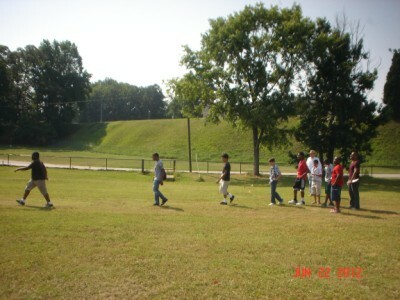 Station five by manned by Sid Autry, P.E., PLS and had the students count the number of paces in a 100 foot length and then count their paces in an unknown distance. Many were amazed at how close they came to the actual distance. 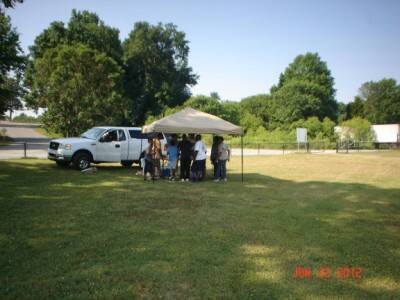 The snack tent, station six, became very popular as the morning heat increased. Brett Abernathy, P.E., PLS and his two daughters gave out beverage and light snack to each student and their adult team leaders. Several old survey plats of the WSSU campus, circa 1945, were provided by Dickie Bennett, PLS. Brett had these at the snack tent and pointed out platted features along with a recent plat Allied Associates had completed of a portion the WSSU campus. The event was concluded in the classroom with Sid Autry discussing the educational opportunities in the Triad for careers in surveying.